London, 1969. 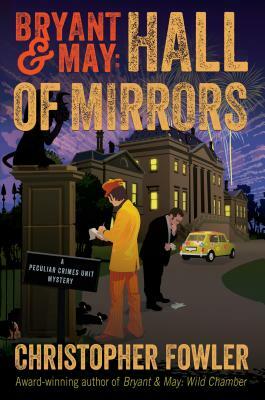 With the Swinging Sixties under way, Detectives Arthur Bryant and John May find themselves caught in the middle of a good, old-fashioned manor house murder mystery. Hard to believe, but even positively ancient sleuths like Bryant and May of the Peculiar Crimes Unit were young once . . . or at least younger. Flashback to London 1969: mods and dolly birds, sunburst minidresses—but how long would the party last? After accidentally sinking a barge painted like the Yellow Submarine, Bryant and May are relegated to babysitting one Monty Hatton-Jones, the star prosecution witness in the trial of a disreputable developer whose prefabs are prone to collapse. The job for the demoted detectives? Keep the whistle-blower safe for one weekend. The task proves unexpectedly challenging when their unruly charge insists on attending a party at the vast estate Tavistock Hall. With falling stone gryphons, secret passageways, rumors of a mythical beast, and an all-too-real dismembered corpse, the bedeviled policemen soon find themselves with “a proper country house murder” on their hands. Trapped for the weekend, Bryant and May must sort the victims from the suspects, including a hippie heir, a blond nightclub singer, and Monty himself—and nobody is quite who he or she seems to be. CHRISTOPHER FOWLER is the acclaimed author of the award-winning Peculiar Crimes Unit mystery series. In 2015, Fowler won the coveted Crime Writers' Association Dagger in the Library Award in recognition for his body of work. He lives in London, where he is at work on his next Peculiar Crimes Unit novel.